The record is made up of 1 file (28 folios). It was created in 1870. It was written in English. The original is part of the British Library: India Office The department of the British Government to which the Government of India reported between 1858 and 1947. The successor to the Court of Directors. Records and Private Papers. Resolution of Government of Bombay - - - . on the East Coast of Africa with the Slave Trade. Agent and Consul at Zanzibar. India and the Political Agents, Kutch and Zanzibar. India in Zanzibar, but allowing them to retain domestic Slaves. or Slave-dealing by Natives of India in Zanzibar. This file contains a selection of correspondence, extracts and reports regarding the involvement of British subjects from the Princely State of Kutch [Cutch] in the slave trade in Zanzibar and attempts by the British Government to end this involvement. Much of the correspondence is from Britain's Political Agent A mid-ranking political representative (equivalent to a Consul) from the diplomatic corps of the Government of India or one of its subordinate provincial governments, in charge of a Political Agency. in Zanzibar, Henry Adrian Churchill and Britain's Political Agent A mid-ranking political representative (equivalent to a Consul) from the diplomatic corps of the Government of India or one of its subordinate provincial governments, in charge of a Political Agency. in Kutch, Major Alexander Young Shortt. This includes translated copies of correspondence between Churchill and the Sultan of Zanzibar, Seyd [Sayyid] Majid bin Said. On folio 128, the file contains a proclamation issued by the ruler of Kutch, the Maharaja Dhiraj Mirza Maha Rao Shree Praguruljee, that warns his subjects in Kutch of the penalties of being engaged in the slave trade in general and specifically in Zanzibar. The file is arranged in rough chronological order. 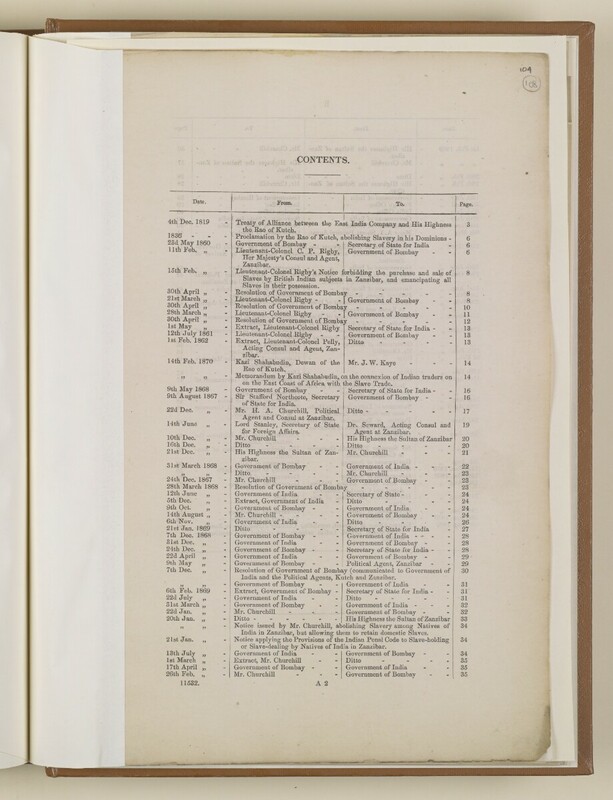 A contents page is included on folio 108. Condition: the file is contained within a bound volume that contains a number of other files. Foliation: The foliation for this description commences at f 107, and terminates at f 134, as it is part of a larger physical volume; these numbers are written in pencil, are circled, and are located in the top right corner of the recto The front of a sheet of paper or leaf, often abbreviated to 'r'. side of each folio. An additional foliation sequence is also present in parallel between ff 5-134; these numbers are written in pencil, but are not circled, and can be found in the same position as the main sequence.